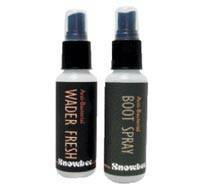 These unique products, exclusive to Snowbee, keep waders and boots fresh and free of odours and mould. They are derived from Chitosan, a totally natural, biodegradable product, extracted from the shells of shellfish. Chitosan has natural antimicrobial, antiseptic, deodorant and fungicidal properties.